Sergeant detective Denny Malone is the baddest cop in New York City. He made his way to the top by breaking all the rules. He follows his own code, not the code written by bureaucrats in New York, Albany, Washington, or anywhere else. As long as he kept making New York Times caliber busts and putting criminals behind bars (or in coffins), they closed their eyes, but his own code is getting harder to define. He could justify cutting corners to make a bust or lying to get a warrant, but breaking the rules to enrich himself has left him disillusioned. Through flashbacks from a jail cell, we follow him step-by-step as he crosses lines from being an idealistic cop to a dirty cop to a filthy cop. At rock bottom and long beyond redemption, he’s plotting to go out in a sacrificial blaze of glory to prevent the rest of the city from burning to the ground. 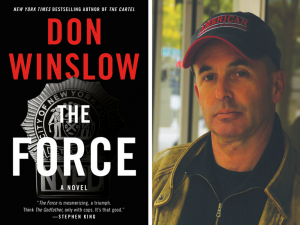 Winslow reigns as king of epic crime fiction. His 2015 work, “The Cartel,” examined the brutal lives of Mexican Narcos and the people who sell their souls to fight them. “The Force” returns to our side of the border to explore the relationships between the police, the (mostly black) inner-city denizens whom they protect and serve, and the politicians who view both sides as a means to an end. Once again, Winslow captures the Zeitgeist, bringing the headlines to life. This novel is so strikingly topical, it’s hard to believe he’s been researching it for 5 years, but his willingness to put in work doing the research is what separates him from other crime writers. While making allowances for a larger than life anti-hero in Malone, the rest of the book is saturated in gritty realism. It’s a street level view of the messy complexities and contradictions of race relations, and a deep exploration into the human heart in conflict with itself.